Photo courtesy of Lita Aruperes. 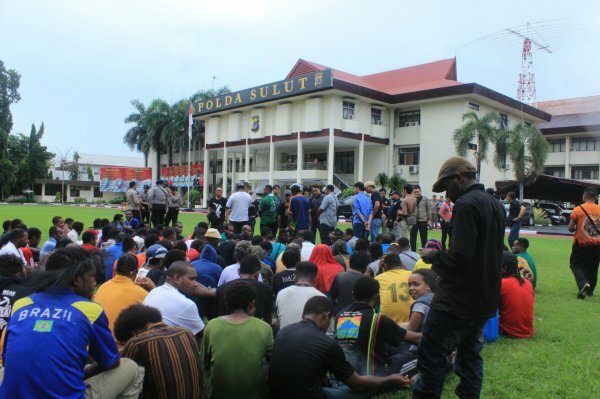 On Monday 19 December 2016, the Indonesian police arrested more than 70 Papuan students ahead of a peaceful rally to ask for a referendum on the independence of West Papua. Accused of treason, 4 of them are still in jail for attempting to voice their political opinion, and risk a prison sentence of 20 years or more. The detention of four students from Papua who have been accused of treason by Manado Police, has been extended to February 17, or 40 days since their arrest. Manado Police crime unit head Commissioner Edwin Humokor said Tuesday the case dossiers had been submitted to the prosecutor’s office. “Their detention has been extended to simplify the investigation process,” Edwin said. He said the suspects violated article 106 of the Criminal Code on treason, which carried a maximum sentence of life imprisonment and 20 years as a minimum. The four are: William Wim, Emanuel Ukago, Panus Hesegem and Indonesian Consulate of the West Papua National Committee (KNPB) head Hizkia Meage. Lawyer Hendra Baramuli said he would file a pretrial motion to free the four. He said the four had only expressed their opinions and should not have been charged with treason. The four were arrested along with 81 other students in two locations in December last year. The others were released. The KNPB has been campaigning for self-determination in Papua and West Papua provinces, where collectively the two internationally have been referred to as West Papua to distinguish the region from Papua New Guinea.